Are you interested in Art and various artists? Do you like to check out art on a regular basis or to be exposed to art? 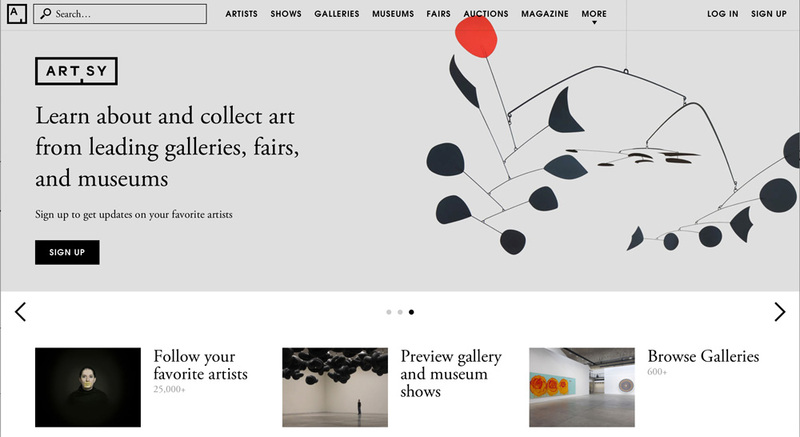 Are you having a hard time making it to a gallery or an art museum? Or do you just want to check out some art whenever you feel like it, without having to even go to a museum or a gallery? If you’ve said yes to one or more of the questions above, then I believe that I have a great website to share with you. Its called Artsy and you can find it here. Artsy is an online gallery where you can not only check out some awesome art, but also read about the artist and get a detailed picture of the person behind the art as well. We are a resource for art collecting and education. When I studied History of Design at the University of North Carolina at Asheville, I wish that I had the access to or known about Artsy since it gives you so much knowledge along with the art you’re looking at. 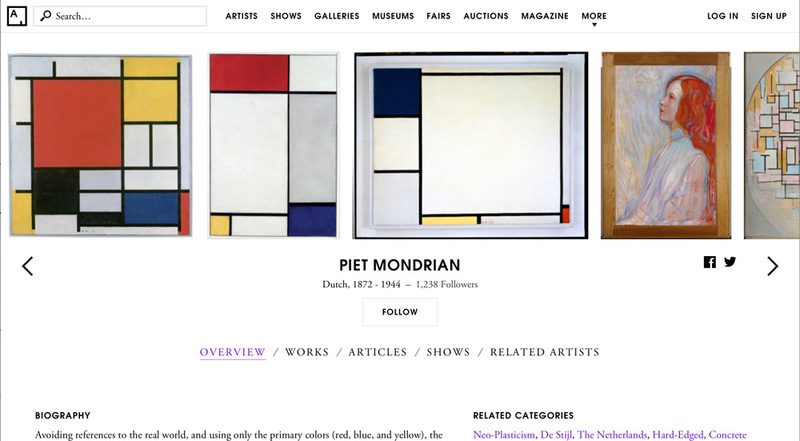 When I went to Museum of Modern Art (MoMa) in New York City last spring (which you can read about here), we checked out, for example, Piet Mondrian (who I had studied at school and who you also can read about here on Artsy!). 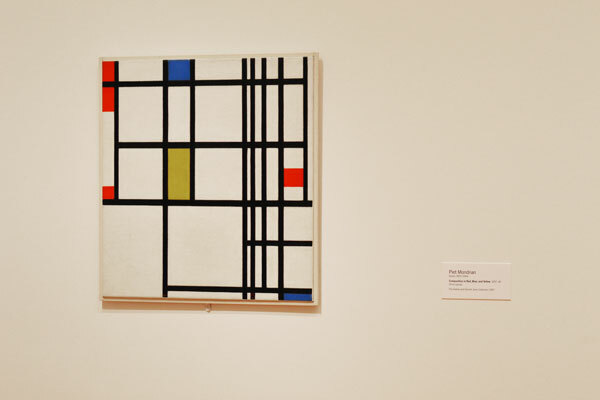 To be enriched with the knowledge that I had gotten from school about Mondrian’s work, and then look at his actual work made a huge difference. However, if you can’t make it to MoMa, for example, or you don’t attend a school to study art or design, but you just love art, then I would say that Artsy is a great resource. Check it out and enjoy! Och vet ni..nu har vi beställt ett piano (tack mamma och pappa som hjälper oss lite på traven!) ♥ Nu kommer jag äntligen att kunna ta upp mitt stora musikintresse och kommer att kunna spela prick när jag vill. Lyckan är total. 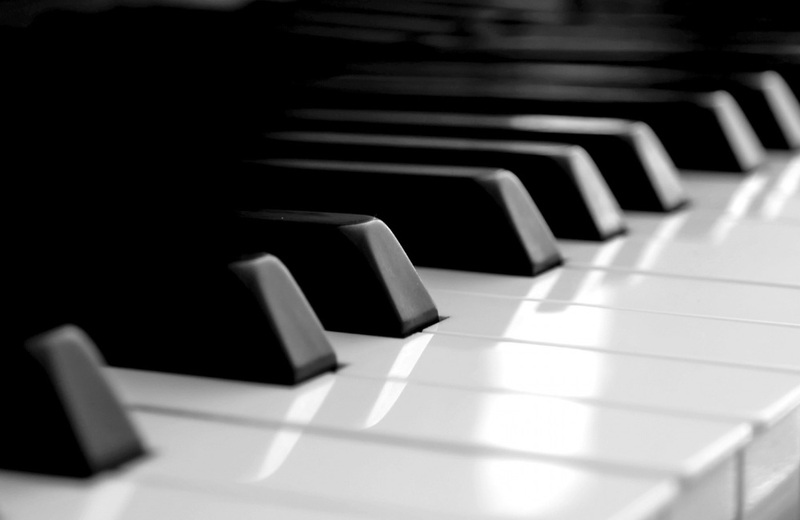 Vi fastnade för ett digitalpiano som har i stort sett ett autentiskt ljud som ett akustiskt piano, men är ett mellanting mellan keybord och ett aukustiskt piano. Jag kan med andra ord använda hörlurar om jag vill (vilket är bra om man bor i en lägenhet, vilket vi gör), jag kan koppla den till en dator, spela in och den har ytterligare ett flertal olika finesser, men det bästa är att det låter som att man spelar på ett akustiskt piano. Det är med andra ord ingen keyboard-känsla. Underbart. Är så himla glad och längtar tills vår får hem den, vilket är troligtvis om bara några dagar. Foton kommer då, förstås. Liz and I spent Saturday, enjoying and celebrating life a little bit extra. We ate out, drank beer, and hung out with my brother, his girlfriend, and a friend of ours. Before we headed downtown, we went to a piano store/factory here in town. My therapist had mentioned about this store and told me that I should go there and play a little since it’s something really good for me to do when I’m feeling a bit blue, and I truly miss music in my life on a regular basis. So we went. And it was heaven…But you know what, we have ordered a digital piano now (it sounds like an acoustic piano but is something in between a keyboard and a acoustic piano. You can record with it, plug in headphones..so it has some major things like a keyboard, but sounds like a real piano) and will be delivered in just a few days. I’m so so soo excited and thankful! My parents are helping us out some with this purchase – thank you, thank you, thank you!! Can’t wait to be able to play exactly whenever I want to! ♥ Please try the more or less good Google translate, if you want to translate the whole text. WHY DID WE CREATE AN ASHEVILLE BEER GUIDE? BECAUSE WE LOVE ASHEVILLE AND WE LOVE BEER. AND WE THINK YOU WILL TOO! Did you know that Asheville was voted Beer City, USA for four years in a row (2009-2012)?! Yep. This amazing, eclectic mountain town is a craft beer mecca boasting 16 different micro-breweries. Everyone has their own favorite beer taste and brewery hangout, of course, so my love and I have decided to create an Asheville (AVL) beer guide to help both visitors, who are new to the craft beer scene, and locals, who are stuck in a beer rut. Basically, because we are craft beer lovers, we want to help our fellow craft beer lovers, like you, discover the many, varied flavors and amazing beer scene that is part of the heart of Asheville. It’s really all about good company, good atmosphere, and good beer. WHAT YOU CAN EXPECT FROM OUR GUIDE: A SERIOUS CRAFT BEER CRAVING. We’re gonna try to present this guide as unbiased as possible, but also offer a few tips of things we have experienced and things we like. We want this guide to be a good place for you fall in love with craft beer and Asheville, giving you a taste of what you might look for when visiting a brewery and trying new beer. But we are not going to rate the beer or the breweries. This is a place where you can get a feel for the vibes and tastes that are waiting for you. We simply want to get all the info in one place, so you can explore and experience on your own! Another reason for not rating the various breweries is basically because it’s so damn hard. Almost every single brewery has their own charm and specialty. In other words, we love and appreciate them all for different reasons. For us, choosing which brewery to visit usually depended on what kind of mood/situation we were in – were were hungry, did we want to sit outside, were we craving a specific beer taste, did we want live music, were we meeting our friends to just hang out, what was the weather like, are dogs allowed, was there a special at a certain brewery on that night? So for us to say that one brewery is overall better than the other is pretty much impossible. It’s also not fair for us to rate the breweries when we haven’t visited them all the same amount of times or tried all of their beer. However, we do have the basic information for you. We have photos. And we have our experiences. And, of course, in preparing for this guide, we did a lot of research. We ran all over town, visiting and sampling beer at each and every brewery. All for you. WHO ARE THESE BEER CHICKS? Well, we are a half-Swedish/ half-American married couple. We’ve lived in Asheville, visited every single brewery there, marched in protests outside the city hall, created an art-filled life, hung out with family and friends, danced at concerts, become yogis, studied at the local university, soaked up street festivals, and loved every second of living in the funky mountain town. This town fills our souls. But, we also love living in Sweden, where we live right now, creating a life and making even more dreams come true. In fact, newest project (besides this one) is to start doing our own brewing at home. GENERAL TIPS FOR ANY BREWERY/PUB VISIT. Always check the brewerys’ websites! Find out when the different breweries have their special deals, like $2.50 draft or $2.00 pizza, and when there’s live music. Some places don’t serve food, but you can bring your own. Or maybe you want to try the different food trucks that are usually parked outside. Check the brewery’s website for days and times. Most breweries are dog and kid friendly. You’ll see dogs (on leashes) and kids (running free) all over the place, adding to the family, laid-back, everyone is welcome atmosphere. For your budgeting info: A pint of beer is anywhere between $2.50 (on a specials night) and $5.00 (for a special release/small batch brew). Please, please, please order a draft beer. Do not visit a local brewery and get a bottled beer. Get it fresh, cold, and local. That is why you are there! Don’t know what to order? Feeling overwhelmed? Ask the bartender for tips. She or he loves to talk about the beer that is being served, and she or he really wants you to enjoy your experience. Speaking of tips, it is customary to leave a tip in North Carolina. There is always a tip jar on the bar, so when you order your beer, throw in a dollar or two, just to say thanks. If you can’t decide on one beer, order a flight if it’s available. Order 2-6 different taps at the same time, and have a little beer tasting. Totally worth it and very popular. If you know you will be there for a while, open a tab. Give the bartender your card and just keep going back for more. Or pay as you order, whatever you prefer. If you think you’ve have had enough, don’t forget that you can order a half-pint… for half price! So awesome if you just want a tiny bit more. Talk to strangers! Or at least be prepared for people to talk with you. It’s common. You are in the south. People love chatting with other people. Plus, you have no idea what you might learn or who you might meet. In North Carolina, the law requires that you only buy one beer at at time (You cannot go to the bar, order a beer for you and your friend, who is sitting at the table waiting. Each person has to order their own beer). Yes, most places have wifi. So, Instagram or Facebook your beer fun till your heart’s content. This is the original home of Green Man Brewery and a super popular pub in the heart of downtown Asheville. Since they have grown throughout the years, their beer is actually brewed just a few blocks from this pub at the Green Man Brewing Co in the South Slope (see above entry). Jack of the Wood, along with the Thirsty Monk across the street, is one of the pubs that we have visited on a regular basis whenever we lived in/been in Asheville, beginning back in 2008. We have so many memories of various celebrations here like “Marti Gras”, Cinco de Mayo, St. Patrick’s Day, Halloween. It’s also the very first place we got to see our friends Chris and Cristof, play live with their band, “The Wilhelm Brothers”. Live music is a very important part of the Jack of the Wood experience. In any case, the Green Man’s cozy, dark, Irish pub is very close to our heart. THE BEER: See the list of brews under Green Man Brewing. Jack of the Wood also offers an ever-changing array of craft brews from Green Man Brewing, other local brews, and a great wine list and an excellent selection of whiskeys, bourbons and single malts. TWO CHICKS TIPS: Visit during the day to eat some delicious pub grub (the garlic fries are to die for) and drink a pint of Green Man Brewing beer or another local beer on tap. Visit at night to enjoy some live music, usually Irish or bluegrass or local artists. Unlike the other breweries, which are first breweries and then tasting rooms, the LAB ( as we call it) is a brewery within a restaurant. It is located in the middle of downtown Asheville on Lexington Avenue, a very popular funky shopping street. Our experience is that it is a typical tourist place, since it’s easy to find, pretty big building, and on Lexington Avenue. It’s a music venue as well. It’s an ok restaurant, but not one of the classic places we’d put on a beer tour. The cool thing with this place is, that they brew onsite, but if they’re are brewing, for example, a German style beer, their hops and grains come from Germany. On the other hand, you can discuss the travels for the ingredients as well and how good (or bad) it is for the environment. THE BEER: We have not been to the LAB very much, so we cannot really remember what we had here. However, the LAB has a long list of brews available, including many seasonal ones. Plus, they have everything from pilsner to lager to stout to porter, and everything in between. So, find something that sounds good and give it a whirl! TWO CHICKS TIPS: It seems to be a tourist favorite, but not so much a local one. Grab a seat in the open area in the front on the sidewalk and enjoy some majorly awesome people watching as you sip your beer. This is one of the new kids in town, opening in 2014. As the LAB, Thirsty Monk and Jack of the Wood, it is also located right downtown, but it is a little bit hidden between Farm Burger and Salsas, a Mexican restaurant. Walk through the short little alley between the restaurants, take the stairs underground, and you’ll find One World Brewing. It’s pretty cozy and fun to go down into the cellar. THE BEER: Belgian Blonde Ale: Light and refreshing to drink. But, try a flight here. One World’s brews are pretty special tasting, at least we thought so. TWO CHICKS TIPS: As you can tell by their name, One World wants to raise an awareness of global and regional environmental issues, inspiring customers to think about how they might get involved in environmental advocacy. A typical Asheville value, which is awesome, we think. Also, they have live music every Tuesday, Wednesday, and Thursday. Thirsty Monk is the other downtown Asheville pub (in addition to Jack of the Wood) that we’ve been visiting since 2008. Back then, it was just a little dark, basement, stone walled, cozy, European-feeling pub that specializes in Belgian beers. A few years later, business was going so well, that an upstairs was added with a wide selection American Craft beer, and yummy sides to munch on with your beer. Unlike downstairs, the upstairs is light and bright with high ceilings, tall tables with bar stools, a roll up garage door, and a little outdoor bench. Both spaces have constantly rotating taps with at least three Monk beers available at all times. In 2013, the Thirsty Monk added a 1920s style bar on the third floor of their downtown location. At Top of the Monk you can grab a typical famous 1920’s cocktail, get a key to a old mailbox locker, and pick out an appetizer/dessert to go with each drink you order. Membership is a must here. But, it’s only a buck. Then, as things downtown were hopping, Thirsty Monk added two new places in other areas of Asheville. Evangelism – spreading the gospel of the Thirsty Monk! THE BEER: Thirsty Monk Easy Gose: Pilsner, coriander, sea salt. Sounds like Mediterranean deliciousness. Thirsty Monk Screaming Monk: Why screaming? Because it’s super duper hoppy for you hoppy-heads. We are not hoppy heads, so we haven’t tasted it, but we think you should. TWO CHICKS TIPS: The meat eaters report that their pint of bacon is to die for. Go for a flight of beer here. There are way too many to choose from. But, don’t forget to order Monk Beer too! Oh, and be on the lookout for a cross-dressing nun on a unicycle. He/she loves to grab a beer at the Thristy Monk! ABC is Asheville’s third oldest brewery with two locations to dine in and the third one for take out/delivery. It’s not only great beer, but yummy food as well! And it’s a classic, must-experience brewery in Asheville. The ABC downtown is a super place to sit and eat outside. It’s an old gas station/garage, so it’s covered, but the atmosphere is great. Relaxed. Cozy. And fun! Play games. Eat pizza or a burger or nachos. And, of course, drink some of their beer. The ABC North is the old school ABC place, still wildly popular with locals today. It also known as the “Brew and View”. It’s a super funky building, with tons of movie quotes, posters,and film images everywhere. Here you can sit in the restaurant, or go watch a movie in their theater (while you eat and drink of course), or take your kids to the big game room in the back. The ABC South is only a take out/delivery place. But, if you are staying around there, give ‘em a call and order some pizza and beer for delivery! (ABC North also delivers, FYI). THE BEER: Rocket Girl: Lina’s favorite go-to beer. She’s so beautiful and easy to drink. Shiva I.P.A and Ninja Porter: Two of ABC’s absolutely most popular brews! Escape Artist: Liz’s fave ABC beer. It’s like magic. TWO CHICKS TIPS: Bring your old receipt from your previous visit, show it to the waitress before paying, and you’ll get 10% off. Tuesdays are $2.50 for all their canned beer and you also only pay $2 per pizza slice. On Mondays, it’s “beat the clock Monday” (between 4 and 9pm). The time you order is the price you pay! The price is for a medium cheese pizza. Burial opened in 2013 in the new, majorly hip area known as South Slope. It has been a rather locally-known brewery, only serving small batches of experimental beer at their cozy, industrial tasting room in their little brewery. However, it’s such a popular place, they started expanding during the spring of 2015. They have upped their brewery, and they have a bigger outdoor area, plus they are creating a rooftop bar. Can’t wait to visit that! Every Sunday is Jazz Brunch where you can eat brunch, listen to some live jazz, and drink beer. Yes, you heard right! Burial beer is not about death, like you might think with the name “Burial”, but it is all about celebrating life together. THE BEER: The Crucifix Triple: It’s just good. Trust us. A hoppy, fruity pilsner. Skillet Donut Stout: Delicious liquid, served with a donut. For real! But, seriously. Get a flight. TWO CHICKS TIPS: The first time we visited, we were overwhelmed by the intriguing descriptions of the beer, and we couldn’t decide what to order. There are things like doughnut stout, coffee beer, thai noodle beer, etc. We wanted to everything, so we created a flight of 6 different taps. Super smart! This brewery was established in 1997, which makes it one of the oldest breweries in Asheville. The beer is traditional English styles mixed with innovative new flavors. The bar is right where the brewery is so you can see all of the brewing in action (like at most of the breweries actually). However, their main production is located in a building next door, where you can take a tour on Saturdays at 3pm. By late summer of 2015, they’re opening their new “Ale Garden” in their South Slope area that will overlook the Blue Ridge Mountains. The perfect place for a pint. THE BEER: Wayfarer: Our personal favorite in the summer time at Dirty Jacks. Cool and citrusy, and a reminder of days by the sea. Green Man ESB: An award winning signature brew that is an all-around favorite amber ale. TWO CHICKS TIPS: If you wanna sound like a local, refer to this brewery by its nickname: “Dirty Jacks”. Green Man trivia: The symbol of the green man is a symbol of rebirth, or “renaissance”, representing the cycle of life that we see in the spring. We don’t have that much experience of our own of Hi-Wire Brewing, however their Circus-themed branding is pretty cool and unique. As the brewery describes it: “Our light-hearted circus theme embodies the fun, authenticity, and creativity of this deep-rooted craft“. Hi-Wire is another South Slope, warehouse brewery that seems to be doing so well that it’s time to expand. Their new facility will be a 20,000 square foot space and will open in the summer of 2015 and will be referred to as the Biltmore “Big Top”. It will be located between Biltmore Estate and downtown, the perfect place for visitors. THE BEER: HI-Wire Lager: A true American lager made with Pilsen malt. Fresh and easy to drink. Bed of Nails IPA: A local favorite, though we’re not huge IPA fans, so we haven’t tasted it. Just sayin’. TWO CHICKS TIPS: Be sure to pay attention to logo and theme of this brewery. It’s pretty rad! This brewery just opened in 2014. Walking in, the first thing we noticed were the huge, beautiful, fermenting tanks facing the windows (pretty damn cool, we think). The whole place smelled like beer and freshly sawed wood. There is a cozy wooden bar and lots of picnic tables with games available It was s super laid-back place, filled with people, dogs, laughing, talking, and enjoying the one of the newest places in town. TWO CHICKS TIPS: We haven’t tried it, but apparently they offer a yoga and beer combo. Sounds pretty freaking awesome. First, you do some yoga, then you drink some beer. Can you be much more zen? Check out their website for days and times. Specializing in West Coast style beers and Belgian style ales, along with locally sourced food, Wicked Weed has literally burst on the AVL beer scene in 2012. The building is a cool, renovated Art Deco building (which Asheville is famous for, the Art Deco style buildings). If you want to drink beer combinations you’d never thought anyone could think of, then this is the place to go. We’ve had, for example, a Mango Jalapeño Blonde (A Belgian Pale Ale style) and French Toast Stout (an American Double/Imperial Stout). Good food, presented nice, cozy seating in various places – upstairs or downstairs, inside or outside.In the summer of 2015, Wicked Weed will be moving their main production to a new, gigantic space in Candler (Western side of Asheville). There they will do most of their brewing, have a tasting room, and an outdoor space. Things are going good for Wicked Weed. THE BEER: The Mango Jalapeño Blonde: Hands down one of the best beers Liz has had so far. Freak of Nature Double IPA: The flagship, west coast style beer. A local favorite. But, seriously, try something that sounds crazy and weird. It’s why we visit Wicked Weed! TWO CHICKS TIPS: There is always a long line waiting to get in. Walk right up to the hostess and say that you are gonna grab a beer downstairs in the tasting room, and you don’t have to wait to be seated! Plus, it’s amazing downstairs – and there is an outside space. You may even hear a little bit from a concert playing next door at the Orange Peel (a pretty cool music venue). With so many crazy, new and weird concoctions, some brews might only be around for one batch and others may return, so if you see something interesting, go for it. It might be a once in a lifetime chance . The Funkatorium opened in 2014 and is part of Wicked Weed Brewing, specializing is sour, barrel-aged brews. It’s a quick walk through the South Slope area from the main brewery. The vision in this cozy, small space is to have a “wild and sour” tasting room. You can also see all their barrels stored with beer, which is a huge collection. The barrels are wine barrels from all over the country. If you’re into sour beer, this is definitely the place to go to. THE BEER: Anything. It’s all sour and special and interesting! TWO CHICKS TIPS: Walk through the tasting room and into the back rooms where the barrels are. It’s pretty freaking impressive. And gorgeous. 1. South Slope: 32 Banks Ave.
Catawba Valley Brewing Company was incorporated in 1996 in Morganton (ca 45 min east of Asheville). However, because of their popularity, in 2014, they opened a tasting room in Asheville’s Biltmore Village. It’s a fairly small place, with a small bar and some picnic tables inside. It feels like hanging out in a friend’s garage, but it’s got character and is perfect for meeting someone for a beer or two. We’ve only been to the one in Biltmore Village, since we moved from Asheville in January 2015, but they opened a whole, new, big brewery/tasting room in April 2015 complete with two bars and a courtyard. Plus there are 24 taps at the front bar and 6 at the back. Sounds like a place totally worth a visit! THE BEER: King Don’s Pumpkin Ale: The best pumpkin ale in Asheville, we think. And we’ve tried them all. White Zombie White Ale: Sounds like another autumn brew, but it’s so popular, it’s available year round. Sounds scary, but easy to drink. TWO CHICKS TIPS: As many other breweries in town who don’t sell food, you can bring your own. But, there is no membership fee here. So grab a pizza and then enjoy a pint. Named after the ancient river that runs through Asheville, French Broad Brewery was founded in 2001. It’s hidden away just south of downtown in a little warehouse. The tasting room, which is right in the middle of all of the brewing area, is small and very simple. It’s non-pretentious and feels like a neighborhood hangout. We’re betting that many tourists don’t make their way to this brewery, but it should be on anyone’s list. For the beer, the atmosphere, the people. 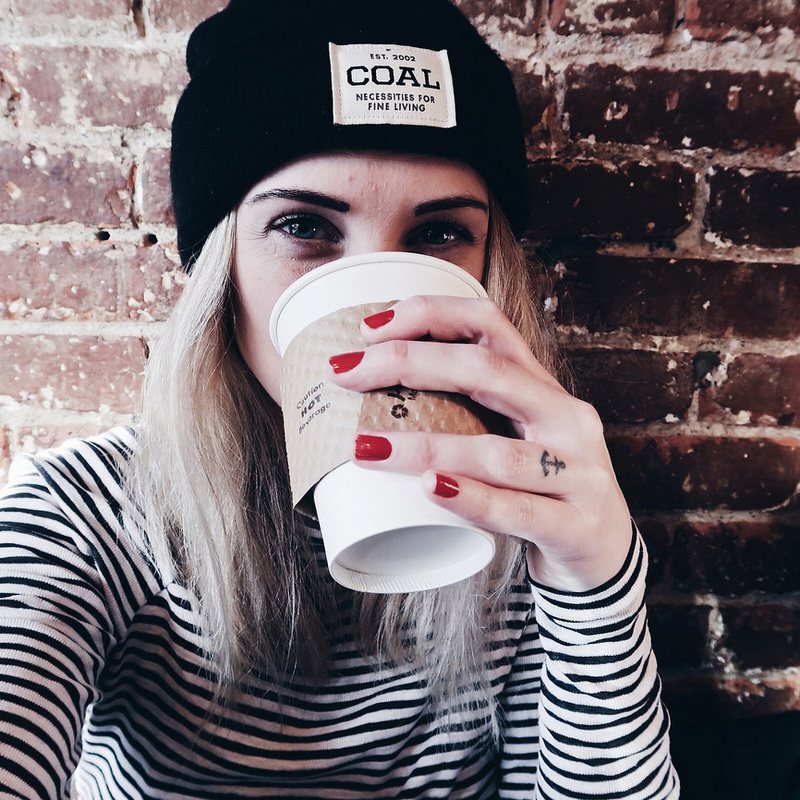 This is no “hipster” scene, mind you. It’s just regular people, meeting to drink a beer after work and catch up. We love it here. THE BEER: Gateway Kölsch (when you order, just say “Kolsch”): A refreshing, crisp throwback to German kolsch beer. 13 Rebels ESB: Named for the original 13 colonies (before the US was the US), it is another local favorite and available all the time. TWO CHICKS TIPS: Pints at the Tasting Room are typically $3.50 and are a dollar off on Mondays. Growler refills are typically $7.00/$8.00 and a dollar off Wednesdays. Live music on the Tasting Room stage is be performed every Thursday, Friday and Saturday night. But, take note: the tasting room is only open until 8:00 pm! The oldest brewery in town, founded in 1994, Highland was the first legal brewery in Asheville since Prohibition. They used to brew their beer in the basement of Barleys Taproom, a local and tourist’s favorite restaurant in downtown Asheville. Now they are located in East Asheville with a big tasting room, outdoor seating, and the “Meadow” – a big grassy area with a stage, where, during the warmer seasons, they have live music, dancing, and food trucks to complete the party! Inside the tasting room, there is also a stage where there is live music every Wednesday, Friday, and Saturday.This brewery is such a classic. It is Asheville, in Liz’s opinion. Stop by after work, grab a pizza, bring the family, or just meet your brother (which Liz did often!) for a little conversation. Being one of the (if not the) most popular breweries in Asheville, Highland’s success has made it possible to begin adding a production expansion with rooftop beer garden. We can’t imagine simple, down-to-earth Highland becoming any better. But, we are sure it will! THE BEER: Gaelic Ale: This is pretty much what we would drink every time we visited. An amber American ale. So delicious, with lots of flavor. The classic. Cold Mountain: The super popular spiced winter ale that is so big there is a special release party for it. And you could just stand in line for two hours waiting to buy a case to take home because you can’t find it in stores for long! 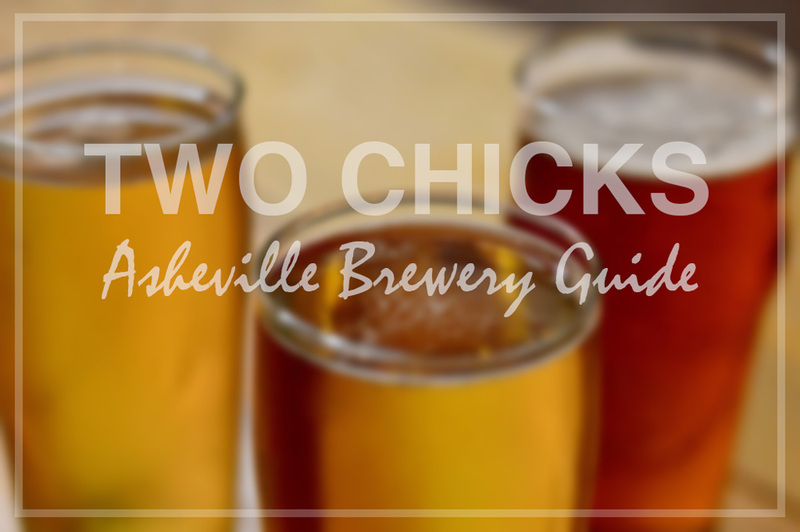 TWO CHICKS TIPS: Considering this is the oldest, and one of the most popular, breweries in Asheville, you must visit. And, if you are in the area during tate November/December, get the famous Cold Mountain Winter Ale. It’s so popular, it only lasts about a month and a half! Altamont is a small, relaxed brewery in hip West Asheville, where it’s all about drinks and music. It has a open floor plan, a long bar, a little stage for entertainment, and some outdoor seating. Along with their own brews, they also have a large rotating guest beer on tap. This place is all about kicking back and slowing down. You are welcome to bring your dog, play a game of foosball or just sit and chat. And drink, of course! THE BEER: Amber ale: A good, basic amber ale. Laid back and simple, like the brewery. It’s tempting to try some of the guest beer they have on tap, but, when in Rome, drink some of Altamont’s beer. Live like a local. TWO CHICKS TIPS: According to the law, when selling alcohol and no food, you gotta have a member system, so that means that a brewery sometimes might be considered a club. Therefore, be prepared to become a member for the cost of $1. No biggie. It all started with the desire to brew the perfect oyster stout. And, after years of experimenting, what resulted was the opening of the Oyster House Brewing Company in West Asheville. Even though oysters might sound like they make the place upscale, they don’t. It’s a laid back, relaxed place where you can sit at the bar, on a couch, or at a table. They’ve got good food too, and of course, oysters. TWO CHICKS TIPS: It’s a small, cozy place, so feel free to grab a seat at the bar and enjoy the view from there. That’s what we did. Plus, we guarantee that you’ll get to strike up a conversation with your neighbor. And, for god’s sake, order some local oysters – if you are in to that! We call it The Wedge. And it is the premier outdoor brewery located right in the middle of the popular River Arts District, home of tons of local artists and grassroots businesses. There is great outdoor seating – repurposed metal pieces made into tables, picnic tables, reused chairs. Everything is up-cycled. You really only go inside to order your beer and grab a bowl of free peanuts. There are a couple of bar stools inside, but literally, it’s only a couple. If you are hungry for some grub, then plan on getting something from the food truck of the day. Check the website for schedules, menus, and times. And don’t forget to play some corn hole (a classic southern American tossing game). During the summer seasons, they also have outdoor movies which start 15 min after sun down. Cozy strings of llights, plenty of outdoor seating, food trucks, free peanuts, the movies, and located in such a creative environment, makes the Wedge a popular place. THE BEER: Payne’s Pale Ale: Made from a brewing process called dry hopping. We usually savor this one or the Julian Price. Julian Price Pilsner: an almost champagne -like American pilsner. Iron Rail IPA: Their most popular beer. An English style India Pale Ale with apricot notes. TWO CHICKS TIPS: Try the El Kimchi food truck (Korean/Mexican street food)! Sooooo good! Check the website for the days that it’s at The Wedge. Located in Waynesville, about 30 min by car, West of Asheville, is this cute little mountain town which has its own brewery located in an area called Frog Level, along Richland Creek and the railroads. This is a block of your typical old warehouses with brick walls, big industrial-windows, and big rooms. Enjoy the inside, or go out on the back deck where you can hear the creek and enjoy the beer in this slow mountain town. Bring your own food if you’re hungry. This is a perfect place if you would like to enjoy a smaller town and get some craft beer. Located in Brevard, and right at the gates for Pisgah National Forest, you can find Oscar Blues Second Brewery. The original one, located in Colorado, is probably the most famous one, but if you find your way to Brevard, a good tip is to check the brewery out and perhaps sip some of the famous Dale’s Pale Ale. Located in Black Mountain, about 10 min by car, east of Asheville. They are known for using organic malts and whole leaf hops, and the signature, Pisgah Pale Ale is one of the most popular ones. We enjoyed live music, and food from a food truck when we were there. It’s also the home to one of the best outdoor music venues in Western North Carolina. Their outdoor seating is really cozy, we think. However, it was too cold when we were there so we enjoyed the inside as well with live music playing. This place is very popular, and Pisgah’s beer is shipped throughout the United States, even featured in the move Dumb and Dumber Too. Located on Main Street in Waynesville, a few blocks from Frog Level Brewing Company. For non-Americans, picture Waynesville as a typical American small-town. Now you get the picture. While drinking their beer, try their food as well. It’s good, typical American tavern food. 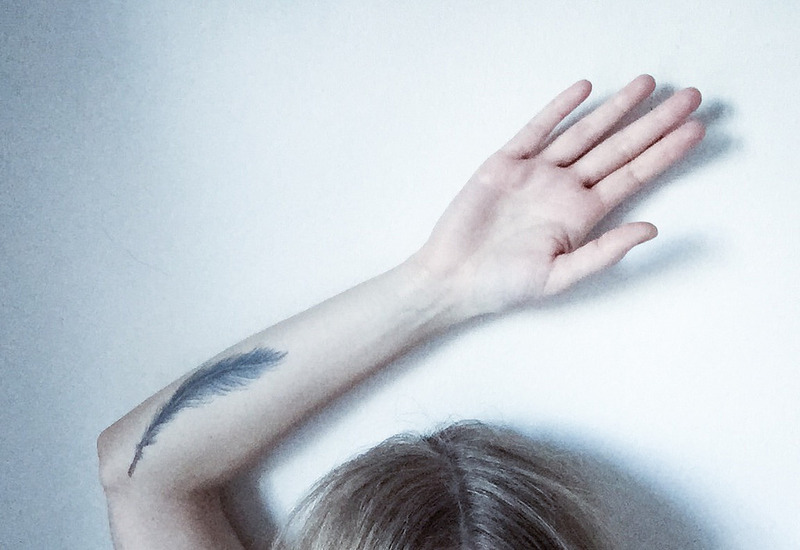 We’ve tried the Hiking Viking Blonde. *Disclaimer: We moved from Asheville in January 2015, and the craft beer scene in Asheville just keeps on booming and changing, with expansions and even new breweries popping up constantly. Since we love Asheville so much, we try to stay as updated as possible through our friends and connections there. But, let’s face it. We live in Sweden, so we may not get the info to you as fast as we’d like. Therefore, check out all the brewerys’ websites that we have provided for you for the latest, most up-to-date information about their hours, what events are coming up, new beer release dates, the days and times for food trucks, and other general news. För tre år sedan hade jag två “val”. Det ena var att de, de professionella, skulle tillkalla en ambulans eller att de själva skulle köra mig till akuten. Ja, det var illa däran. Jag hade inte stoppat i mig någonting alls under en alldeles för lång tid och knappt någon vätska heller. Ja, ni hör ju. Detta var inte hållbart. Idag, fast för tre år sedan, började min riktiga resa till tillfrisknad. Det var då de hjälpte mig att stoppa allting. Det som gick alldeles utför i totalt fel riktning. Bort från livet och ännu djupare ned i helvetet. Det kan vara ganska så ledsamt och sorgligt att alltid uppmärksamma denna dagen. Men det var också den dagen som ledde till en förändring i mitt liv. Den dagen och perioden på sjukhuset som jag också fick möjligheten till att träffa personer som skulle komma att betyda otroligt mycket för mig där och då, men också även idag. Sköterskor som alltid fanns där och som även finns här idag. Jag är så otroligt tacksam över allt alla gjorde för mig då. Men egentligen var det jag som drog det största lasset. Det var jag som kämpade tillbaka till livet. Det var jag som så småningom gjorde det där stora engelskatestet, klarade det, ansökte till ett universitet och kom in, flyttade över Atlanten, studerade där för att sedan få jobb här i Sverige inom det jag hade drömt om – grafisk design. Mycket har hänt sedan den där dagen i maj, 2012 och för varje år som går från just den dagen, tänker jag tillbaka och förundras över vad livet överraskar och ger. Nu ska jag ut och fira livet tillsammans med min älskade Liz ♥ och så ska jag iväg och plinka piano i en pianoaffär (har inte tillgång till något piano här i Uppsala) för jag saknar musiken. Saknar att spela piano så därför har jag fått det i uppgift av min terapeut att göra det. Yep. Hej svejs. Three years ago today, I had two “choices”, one for them, the professionals, to get an ambulance to drive me to the emergency, or for them to take me there themselves. 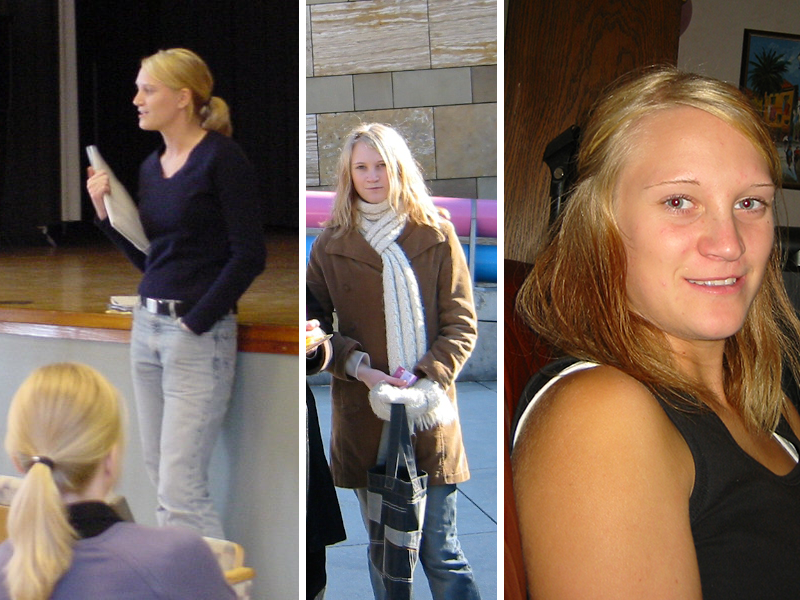 I was really sick with an eating disorder, anorexia. One might think it’s a sad day to think about and remember..but this day, three years ago, was the beginning of my new life. Thanks to all the professionals, but mostly thanks to me, who fought hard get better. So how am I doing today? Some days are less good and some days are good, but I believe that’s the process and how it has to be. Without any bad days, you can’t really experience good days, because there’s no contrast then. Or as a wise person once told me,”It can never be calm unless there has been a storm.” So, today I’m gonna celebrate life, together with my Liz and we’re gonna check out a piano store here so I can play the piano a little since I miss music so much and playing on my own. Got this challenge/project, to play a little, from my therapist, so that’s what I’m gonna do. Yep. Bye bye. Please try the more or less good Google translate, if you want to translate the whole text. För några veckor sedan var Liz och jag i Stockholm (eller ja, det har vi varit varje lördag de senaste veckorna), men vårt mål denna gången var att titta på de underbara körsbärsträden i Kungsträdgården som hade börjat slå. Jag tror inte att jag har timat det en enda gång tidigare i mitt liv, så det var första gången för både mig och Liz. Tycker vi tittar på en gång. 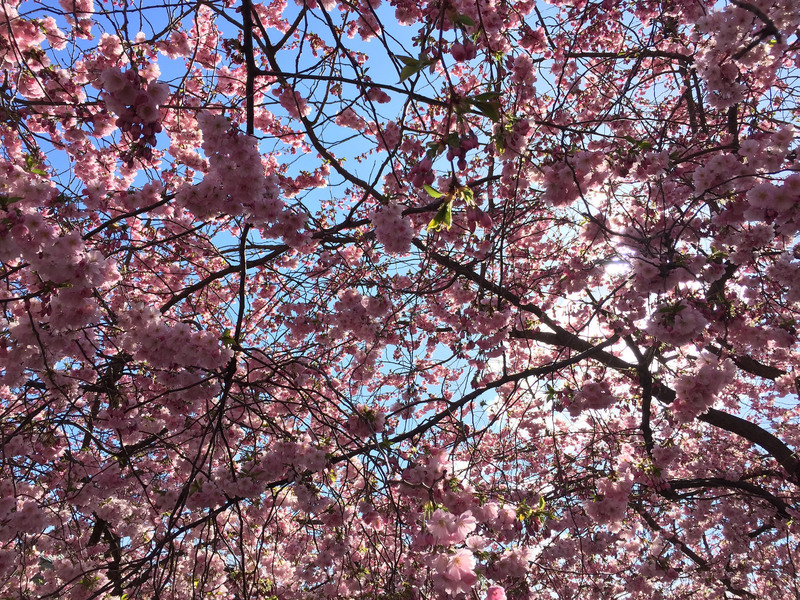 A few weeks ago, Liz and I spent our Saturday in Stockholm and checked out the beautiful cherry blossom trees. Att jag fick grymma betyg när jag pluggade på universitetet i USA. Bra att veta (som också hör till skrytigheten), är att det var ganska så intensivt och strängt med obligatoriska föreläsningar och småtentor hela tiden. Sjukt högt tempo om man jämför med universitet i Sverige. 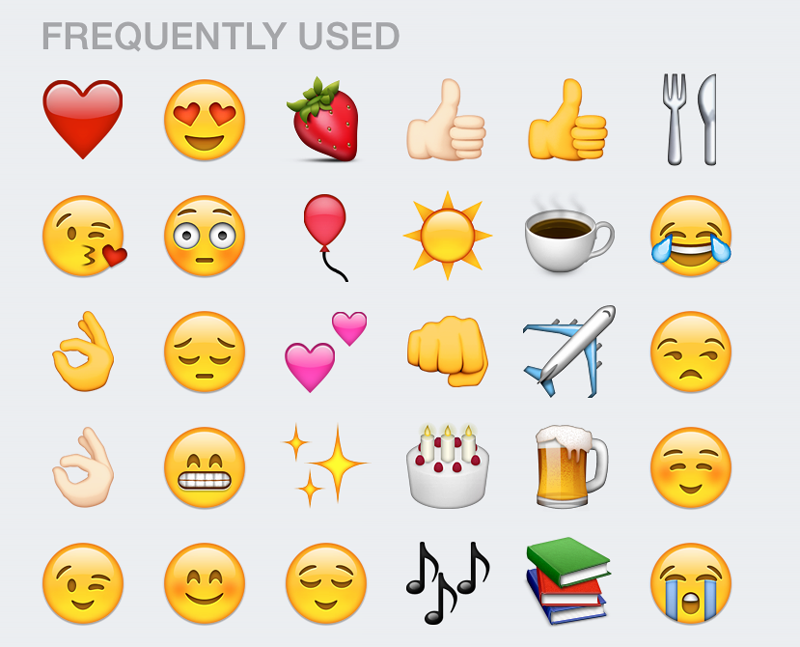 Vilka är dina ofta använda emojis? Hängde med Liz här hemma, totade på Orphan Black samt House of Cards och åt popcorn till middag. Älskar att vara vuxen och få göra precis som jag vill. Vad åt du till frukost idag? Två stycken lingongrova, en med ost och en med bara smör på. Flingsalt också förstås och så och kaffe. Har inget faktiskt. Men måste vara något jämnt nummer i alla fall. Hur såg du ut som artonåring? Det här blev nästan lite jobbigt..Men ja, såhär. Snebena, överplockade ögonbryn och med ett lite stelt/inget leende pga. en operation (föddes med en missbildning). Vilket är ditt senaste köp? Något så sjukt kul (menar det verkligen! ): en stor gryta, 30st tomflaskor, 250st kapsyler och en kapsylregleringsapparat. Vi kommer att bli serious med att brygga vårt eget öl. Men mer om det någon annan dag! Är du allergisk mot något? Hur länge har du varit utan sömn som längst? Tror det är drygt 30h. Vi var ett gäng som hade lussevaka i tvåan eller trean på gymnasiet och kom då på att vi skulle inte sova. Vår klasskompis hade blivit stadens lucia och skulle upp och lussa på flygplatsen tidigt på morgonen, så vår lilla grupp med vänner bestämde oss för att vara vakna under hela natten, åka ut till flygplatsen på morgonen för att kika på luciatåget och vår kompis. Vi åkte sedan hem till mig, åt frukost för att därefter åka till skolan. Det var en ganska seg skoldag. Vilken tid på morgonen vaknar du? Vardag: Har alltid klockan ställd på 07:00, men snoozar ett par gånger och går upp vid ca 07:20 eller i värsta fall 07:30. Har relativt flexibelt jobb men försöker alltid att vara på plats vid 9. Tycker dock om att äta frukost och dricka kaffe framför Nyhetsmorgon på TV och vill därför ta det relativt lugnt på morgonen. Funkar sisådär då jag snoozar lite för länge. 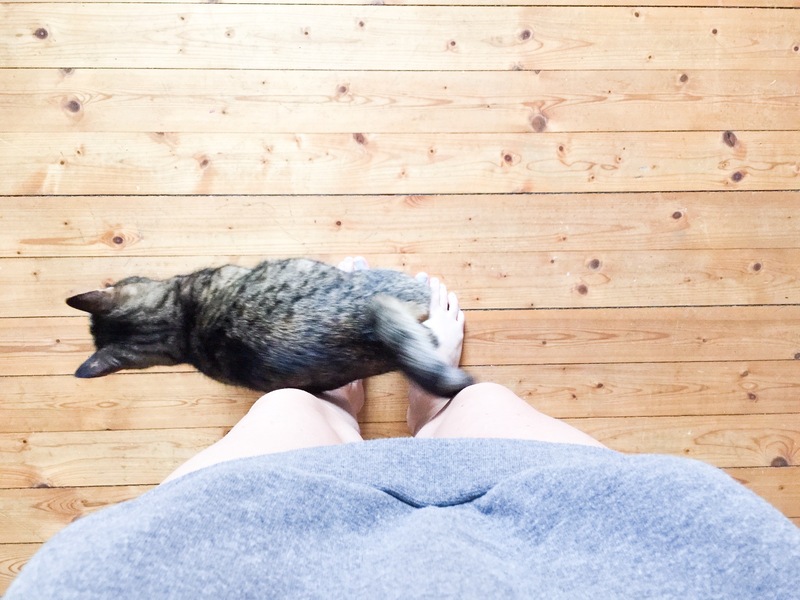 Helg: Sover så länge jag kan, vilket brukar bli till senast 9. Hur ser du oftast ut till vardags? Försökte att hitta en bild som visar hela outfits (men har tydligen inte en enda). Men here we go: Svarta vans/Converse eller vita/svarta Adidas Originals, jeans, svart t-shirt och någon kofta som är lite längre. Ofta flera ringar på mig på olika fingrar samt håret utsläppt. Necessär. Fast nu tror jag att jag fick till det på första försöket i alla fall. Ha. Listan är helt tagen från Sandra Beijer – Lördagslista, fast min blev en söndagslista helt enkelt.